So naturally, I try to minimize how much time I spend doing certain tasks so I can work more efficiently. And part of my routine is using a few Pinterest tools that make things so. much. easier. When I first started using Pinterest to promote my blog, I did it the old fashioned way with manual pinning and it took up a lot of time. Over time, I’ve learned so much and with that, I’ve discovered some awesome time-saving tools to add to my arsenal! In this post, I’m sharing these 4 Pinterest tools that will shave hours off your marketing routine. Tailwind is my #1 and holds a special place in my heart. I don’t think I could live without it! Pinterest requires constant attention and engagement. Like daily. And because of that, so many people put it off and ignore it as a potential traffic source for their website. It seems like too much work, but trust me it is WORTH IT. The hack to saving a bunch of time is using the Tailwind Pinterest Autoscheduler. It basically takes care of the pinning for you. Yup, it’ll take care of your pinning for you even while you’re snoozin’ away in your bed. Tailwind costs $15/month or $119.88/yr. It’s one of my all-time favorite Pinterest tools because I fill my queue up with pins once and week and let it run by itself! Sometimes I fill it up for a whole month and pretty much set it and forget it. One thing I do more actively on Tailwind is use Tailwind Tribes — another awesome feature of the scheduler. They’re kind of like group boards where you can submit your content to the tribes in your niche and the other tribe mates share your content as well. Tailwind & Tribes give me blog traffic a huge boost & are the reason Pinterest accounts for more than half of my traffic! Next up on the list is the Pinterest “Pin It” and Tailwind Chrome Extensions. So first let’s talk about the Pin It extension. Pretty much, this browser extension allows you to easily pin things from the web. If you’re on your fav blog and you want to share a pin to one of your boards, this extension will create a Pinterest save button that will appear any time you hover over the images on the page. I also love using this browser extension to pin my own graphics from my blog to Pinterest. Super easy instead of manually uploading your pins. Besides this, the Tailwind Chrome Extension is just as important and works similarly. It allows you to click and schedule pins directly from websites to Tailwind. And not just from websites. You can also use it when you browse the Pinterest feed! Alright, if you’re not using Tasty Pins then you should be. Tasty Pins is a WordPress plugin that makes Pinterest SEO 10x easier. This plugin gives you more control over your Pinterest marketing strategies straight from your blog. 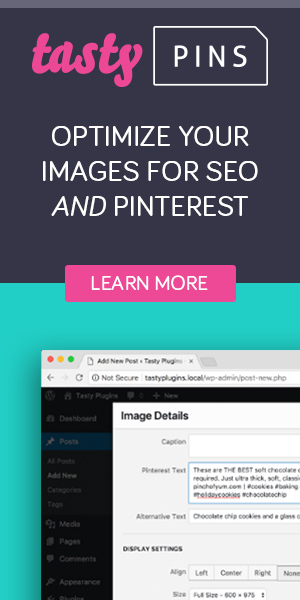 With the plugin, you can control which images and what descriptions get pinned to Pinterest. So when someone pins from your blog, they’re pinning with a carefully thought out and optimized pin description & hashtags created by you! It adds options for Pinterest Text and Pinterest Repin ID. Meaning you can choose what description shows when people try to pin from your website AND you can attribute your image to an already existing pin on Pinterest so it adds up the repin count. Now you no longer have to choose between optimizing your content for Google and optimizing it for Pinterest. You can also add multiple hidden images that only show up when people use your Pinterest save buttons. Awesome, huh?! Tasty Pins retails for $29 per year which is a pretty great deal for everything that it does. Last but not least, let’s talk about Canva. Oh, my beloved Canva! Canva is a graphic design website that helps you create incredible graphics for free (and no you don’t need any design skills whatsoever). It includes so many different templates you can choose from. Even Pinterest templates! So you can get the perfect size pin every time. Then you can use the drag-and-drop interface to create pins in minutes. If you’re not a whiz at Photoshop or creating graphics, then Canva is a MUST. It gets the job done super fast and they have the option to add tons of shapes, elements, gradients, fonts and more. You pretty much have everything you need to make sure your content gets seen on Pinterest. And if you’re new to Canva, check out my in-depth tutorial to see how I design beautiful Pinterest graphics with it. So that’s pretty much it. Those are my top 4 Pinterest tools that I keep in my toolbox at all times! Trust me when I say that they save so much time for me. I really don’t know what I’d do without them. If you’re ready to take your Pinterest marketing efforts a bit more seriously and kick it up a notch, I highly recommend checking out these resources.